Common bile duct stones (CBDS) are estimated to be present in 10–20% of individuals with symptomatic gallstones. They can result in a number of health problems, including pain, jaundice, infection and acute pancreatitis. A variety of imaging modalities can be employed to identify the condition, while management of confirmed cases of CBDS may involve endoscopic retrograde cholangiopancreatography, surgery and radiological methods of stone extraction. Clinicians are therefore confronted with a number of potentially valid options to diagnose and treat individuals with suspected CBDS. The British Society of Gastroenterology first published a guideline on the management of CBDS in 2008. Since then a number of developments in management have occurred along with further systematic reviews of the available evidence. The following recommendations reflect these changes and provide updated guidance to healthcare professionals who are involved in the care of adult patients with suspected or proven CBDS. It is not a protocol and the recommendations contained within should not replace individual clinical judgement. Where recommendations from the 2008 guidelines1 are obsolete, they are omitted. Where recommendations are prefaced by ‘2008’ there has been no new evidence found since the last guideline and no change in the recommendation; ‘2008, amended 2016’ indicates that while no new evidence has been found since the last guideline there has been a change in wording that effects the meaning of the recommendation; ‘2016’ indicates that new evidence has been found and no change in the recommendation is necessary; ‘New 2016’ indicates that new evidence has resulted in a new or amended recommendation. Earl Williams. Consultant hepatologist, Royal Bournemouth Hospital, representing BSG. Chair of GDG, Editor and lead for introductory and concluding sections; section on general principles in the management of CBDS and section on identification of individuals with CBDS. Peggy and Hannah Anderson. Patient representatives, approached via British Liver Trust. Ian Beckingham, Consultant HPB surgeon, Nottingham University Hospitals, representing Association of Upper Gastrointestinal Surgeons of Great Britain and Ireland (AUGIS) and Royal College of Surgeons. Lead for section on surgical management of CBDS. Ghassan El Sayed. ERCP fellow, Royal Bournemouth Hospital. Representing GI trainees. Responsible for literature search. Kurinchi Gurusamy, Reader in Surgery, University College London and member of European Association for the Study of the Liver guidelines panel for management of gallstones. Co-author of sections on development process for guideline; identifying individuals with CBDS and surgical management of CBDS. Richard Sturgess, Consultant hepatologist, Aintree Hospital Liverpool, representing BSG. Lead for sections on management of “difficult” ductal stones and management of CBDS in specific clinical settings. George Webster. Consultant gastroenterologist, University College Hospital, representing BSG. Lead for section on endoscopic management of CBDS. Tudor Young, Consultant GI Radiologist, The Princess of Wales Hospital, Bridgend. Representing Royal College of Radiologists and British Society of Gastrointestinal and Abdominal Radiology. Co-author of section on identifying individuals with CBDS. Jonathon Green, Rowan Parks, Derrick Martin and Martin Lombard; co-authors of the 2008 BSG guidelines on management of CBDS. Andrew Langford, Chief Executive, British Liver Trust. Ashley Guthrie, President of the British Society of Gastrointestinal and Abdominal Radiology. A literature search was performed using PubMed and Medline. The search terms employed were common bile duct stones, gallstones, choledocholithiasis, laparoscopic cholecystectomy, ERCP, sphincteroplasty and cholangioscopy. The search was restricted to English-language articles published 6 months before the last BSG guideline or later (ie, June 2007 onwards). Articles were selected by title and their relevance confirmed by review of the corresponding abstract. Systematic reviews and full-length reports of prospective design were sought. Retrospective analyses and case reports were also retrieved if the topic had not been addressed by prospective study. Guidelines published by national and international bodies were automatically included for review. Data published in abstract form only were considered if full-length papers addressing the same issue were lacking. The GDG corresponded with one another to identify the principal clinical developments since publication of the 2008 guideline. The topics that would need to be addressed in order to answer the key questions were agreed at this point and each section of the guideline was assigned a lead author. Upon completion of the literature search, section leads drafted preliminary recommendations linked to a referenced narrative. As part of this, they were asked to search the reference lists of retrieved papers for missing articles and were also free to suggest additional references for consideration. The GDG met at University College Hospital London on 13 December 2014. The output from each section lead was reviewed and each recommendation contained within the 2008 guidelines was considered and judged as being still valid, in need of revision, obsolete or no longer valid. A new set of recommendations were generated at this meeting. Evidence was graded for each recommendation by discussion and consensus among the GDG members, based on the group's confidence in the effect of an intervention and whether further research was likely to alter confidence in the estimate (table 1). The GDG took account of the principles of the GRADE working group3 and considered risk of bias in the included studies, inconsistency, indirectness, imprecision and publication bias. However, given the large number of interventions examined the group did not attempt to produce outcome tables with pooled estimates of effect. Recommendations were graded as either strong or weak (table 2). The revised output from the group was reviewed by the BSG Endoscopy Committee on 13 May 2015. A draft document and was then forwarded to the Royal College of Surgeons, Royal College of Radiologists, AUGIS and the British Liver Trust. Comments from the professional and patient groups were received and considered by the GDG at a meeting held on the 27 September 2015. In a number of areas, it was recognised that while evidence was weak there was clear consensus among members of the GDG regarding the optimal clinical approach, and in this situation it was agreed by the contributors to make a strong recommendation. In keeping with BSG policy, the guideline was then reviewed by the Society's clinical services and standards committee, prior to submission for publication. Additional references were incorporated into the guideline following anonymised international peer review and the finalised recommendations were ratified by the GDG. Primary ductal stones form de novo within the intrahepatic and extrahepatic ducts. They are most prevalent in Asian populations and give rise to the distinct clinical entity of recurrent pyogenic cholangitis.1 ,6 ,7 Secondary CBDS originate in the gall bladder and migrate into the bile duct via the cystic duct. They account for the majority of CBDS that occur in European patients. The following guideline focuses on the diagnosis and management of secondary CBDS. Two to four per cent of individuals with stones within the gall bladder will develop symptoms over the course of a year.21 ,22 In comparison to gall bladder stones, the natural history of CBDS is less well understood. Complications of CBDS are potentially life threatening and include pain, partial or complete biliary obstruction leading to obstructive jaundice, cholangitis, hepatic abscesses, pancreatitis and secondary biliary cirrhosis. Such problems can occur without warning,23 but not all patients will experience difficulties secondary to CBDS. Studies confirm that a number of patients will spontaneously pass ductal stones into their duodenum before or after laparoscopic cholecystectomy.14 ,24 ,25 That small unsuspected stones can have a benign natural history is also supported by trials of selective IOC, where the incidence of CBDS-related complications in patients who do not undergo cholangiography is reported to be low.17–20 ,26 This contrasts with a recent national cohort study that examined the outcomes of patients with proven CBDS at the time of cholecystectomy. In the GallRiks study,27 34 200 patients underwent an IOC and 3969 (11.6%) were found to have one or more CBDS. Of the 3828 patients for whom there were adequate follow-up data, 594 (15.5%) received conservative treatment of their CBDS, while those remaining were recommended a treatment strategy that involved CBDS removal. Over a follow-up period that varied from 0 to 4 years 25.3% of patients in whom CBDS were left in situ experienced an unfavourable outcome (which was defined as pancreatitis, cholangitis, obstruction of the bile duct within 30 days of surgery or subsequent symptoms in association with proven CBDS on investigation with ERCP). Only 12.7% of patients for whom some form of stone extraction was scheduled experienced an unfavourable outcome (OR 0.44, 95% CI 0.35 to 0.55). The benefits of active treatment persisted for patients with CBDS <4 mm in diameter, where risk of unfavourable outcome with planned stone extraction was 8.9% versus 15.9% for patients treated conservatively (OR 0.52, 95% CI 0.34 to 0.79). Therefore, in keeping with recent National Institute for Health and Care Excellence (NICE) guidelines,28 patients with CBDS should be offered stone extraction, assuming that they are fit enough to undergo treatment. It should be noted that there are no controlled studies examining the natural history of CBDS that are found incidentally in asymptomatic patients being investigated for other medical problems. Patients should be made aware that advice to undergo stone extraction in this setting is based on evidence from symptomatic patients and expert opinion. The following section examines the performance of the various tests available to the clinician and suggests an algorithm for investigation of patients with suspected CBDS. USS and LFTs are cheap, widely available and safe. They are therefore potentially useful tests for patients who have not undergone previous assessment for possible CBDS. In recent years, a number of studies have examined the performance of one or other investigation. Measuring diagnostic accuracy is difficult as many such studies are subject to bias.34 In addition, the reference standards for patients identified as being at high risk of having ductal stones (ie, endoscopic or surgical exploration) are rarely employed in patients thought to be at low risk of the condition. This makes it difficult to accurately establish the incidence of false negative results. This is important if a normal test means the diagnosis of CBDS is discounted. However, a recent Cochrane analysis34 has been performed based on studies that incorporated at least six months of clinical follow-up for patients who did not undergo endoscopic or surgical exploration.35–39 Assuming a pre-test probability of 0.095 (9.5%), this analysis reported that 45 out of 100 patients with a positive USS, variously defined in studies as the presence of echogenic material in the CBD or CBD dilatation, will have CBDS, rising to 85 out of 100 if pre-test probability is 0.408 (40.8%). Conversely in patients with a negative USS, 3 out of 100 patients with a pre-test probability of 0.095 (9.5%) will have CBDS versus 17 out of 100 patients with a pre-test probability of 0.408 (40.8%). Analogous results for LFTs were dependent on the parameter and cut-off points used, but, if pre-test probability was 0.095 (9.5%), 32 out of 100 patients with an alkaline phosphatase of >125 IU/L would have CBDS versus 2 out of 100 patients with an alkaline phosphatase that was <125 IU/L (noting the average alkaline phosphatase level in an adult population is between 50 and 170 IU/L). The performance of both USS and LFTs according to the pre-test probability of CBDS is summarised in table 3. When there is a persistent suspicion of CBDS and results of LFTs and USS are non-diagnostic, further investigation may be necessary as both USS and LFTs can be normal in people with CBDS. MRCP is produced by a heavily T2-weighted scan sequence that displays fluid, such as bile, as a high-intensity bright signal on the resulting images. Solid material such as CBDS will appear as well-defined, dark-filling defects within the CBD. An echo-endoscope when positioned in the duodenal bulb uses high-frequency sound waves to image the bile duct. When using EUS, CBDS appear as hyperechoic foci, with characteristic acoustic shadowing. Studies that examine the performance of MRCP and/or EUS are heterogeneous with regard to patient selection and reference standards used. The potential for bias is also a concern (when, for example, researchers are aware of index test results when interpreting the reference standard). Nonetheless, when analysis is restricted to published data that incorporate at least six months clinical follow-up for patients who do not undergo duct exploration,45–62 it is possible to demonstrate that both MRCP and EUS perform well. Specifically at a median pre-test probability for CBDS of 0.41 (41%), Cochrane systematic review data63 indicate that the summary sensitivity of EUS is 0.95 compared with 0.93 for MRCP, while summary specificity is 0.97 for EUS compared with 0.96 for MRCP. These results are consistent with other published reviews.64 ,65 It is important to note that the performance quoted does not apply to patients at low pre-test probability of stones (where the incidence of false positives can be expected to be higher) or patients with high pre-test probability of stones (where the clinician needs to be mindful of false negative results). In keeping with the above observations, studies that subject the same group of patients to both EUS and MRCP51 ,53 ,66 do not demonstrate clear superiority of one test over the other in relation to diagnosis of CBDS. Factors that favour EUS over MRCP are that it can be performed in the presence of intracranial metallic clips, cardiac pace makers, mechanical heart valves, claustrophobia and morbid obesity. Factors that favour MRCP over EUS include its wide availability, minimally invasive nature, ability to image the intrahepatic ducts, cost effectiveness67 and suitability for patients with altered gastric or duodenal anatomy. In addition, all images can be captured allowing for review by other clinicians at a later date. For these reasons, current NICE guidelines28 suggest that in most cases MRCP represents the safest and most acceptable test for patients, while acknowledging that appropriately skilled clinicians may choose to use EUS instead and a minority of patients may need both investigations to ensure an accurate diagnosis. CT plays an important role in the identification and staging of malignant biliary obstruction but is not routinely used for the express purpose of detecting CBDS. Formal CT cholangiography, using excreted biliary contrast, is a useful and accurate diagnostic tool68–71 for ductal stones but the required contrast agent has not been available in the UK since 2009. Recent studies using data from modern multislice scanners suggest that standard contrasted CT scanning can also achieve reasonable sensitivity (69–87%) and specificity (68–96%) for detecting CBDS,72–75 although diagnostic accuracy decreases considerably when calculi are small or of similar density to bile. In addition, CT exposes patients to the potential harm of ionising radiation and contrast injection. In current clinical practice, CT is widely used to investigate patients who present with pain or other abdominal symptoms and it is inevitable that a proportion of CBDS will be diagnosed this way. 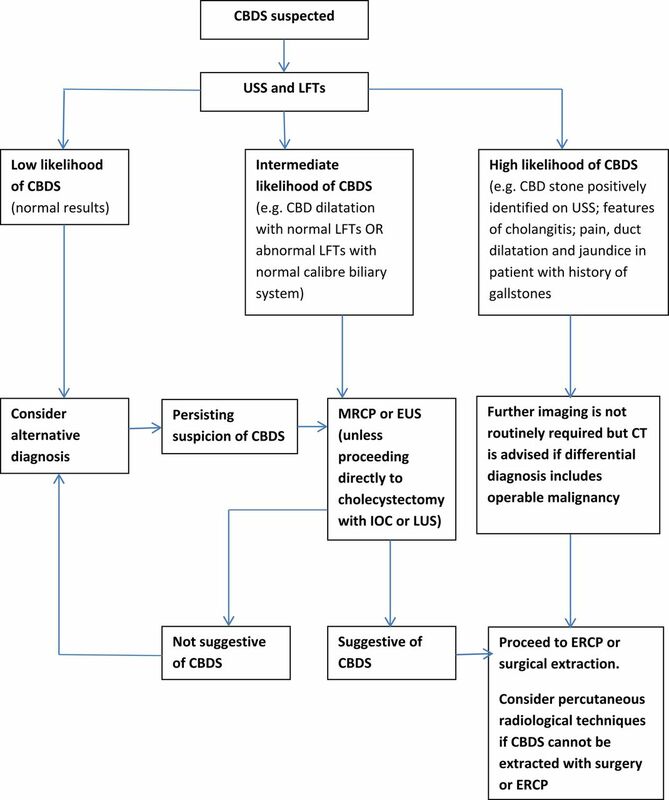 Sensitivity is best when radiologists look specifically for the presence of CBDS.72 The available evidence favours EUS or MRCP as the investigations of choice for CBDS, but CT is an important and appropriate diagnostic test for patients in whom features of CBDS and malignancy coexist. The probability of CBDS may be established on history, LFTs and USS. For example, the American Society of Gastrointestinal Endoscopy (ASGE) indicates that in patients with symptomatic gall bladder stones there is a high likelihood of CBDS if a calculus is visible in the CBD on USS, there are features of cholangitis or the patient presents with a combination of CBD dilatation on USS and jaundice.76 Further investigation prior to scheduling endoscopic or surgical duct clearance is not mandated in this setting, although the need for CT to exclude pancreatobiliary malignancy should always be considered according to the clinical scenario. For other patients, the likelihood will either be considered low (on the basis of normal LFTs and USS in the absence of a preceding clinical predictor such as cholangitis or gallstone pancreatitis) or intermediate. Among the latter group, a common scenario is pain with abnormal LFTs in the absence of duct dilatation on USS or vice versa. Further investigation of patients with a low or intermediate likelihood of CBDS is recommended prior to undertaking endoscopic or surgical bile duct clearance. A suggested pathway for investigation of suspected CBDS is described in figure 1. Investigation of suspected common bile duct stone (CBDS). ERCP, endoscopic retrograde cholangiopancreatography; EUS, endoscopic ultrasound; IOC, intraoperative cholangiography; LFT, liver function test; LUS, laparoscopic ultrasound; MRCP, magnetic resonance cholangiopancreatography; USS, ultrasound scanning. ERCP is a minimally invasive technique that is an effective treatment for CBDS.77 High rates of duct clearance are possible, although the potential for serious adverse events is also recognised.77–79 In a large observational study conducted in England in 2004, >5% of patients undergoing ERCP experienced some form of complication, including acute pancreatitis, bleeding, perforation and biliary sepsis.80 As such, it is essential that the UK offers high-quality training and that clinicians are able to maintain their skills in appropriately resourced facilities. Previous BSG guidelines made a number of recommendations in relation to this. These have recently been updated in the form of a national standards framework for ERCP,81 published in 2014. This describes the minimum standards that service providers should adhere to and also recommends a set of achievable standards that service providers should work towards implementing. In addition, several important developments in ERCP practice have occurred in the last 10 years, which have the potential to improve success rates and minimise risk. These are described below. In summary, clinician and patient opinion is in favour of wider availability of anaesthetist-assisted ERCP in the UK. The demand for propofol-assisted ERCP is likely to increase and should be specifically considered for complex cases of CBDS (eg, intrahepatic ductal stones and cholangioscopy-assisted lithotripsy). General anaesthesia with endotracheal intubation is an alternative but is generally reserved for patients with anaesthetic issues independent of those related to ERCP per se (eg, morbid obesity, airway/ventilation problems). No changes have been made to the recommendation on antibiotic use published as part of the 2008 guidelines on CBDS.1 In the absence of specific risk factors for sepsis such as sclerosing cholangitis, communicating pancreatic cysts, hilar strictures, liver transplantation, cholangioscopy or a failed attempt to drain an opacified bile duct, it is suggested that prophylactic antibiotics can be safely avoided. Acute pancreatitis is a well-recognised complication of ERCP. The frequency of PEP varies considerably in the literature (from <1% to >20%), with 2–5% commonly reported. ERCP for bile duct stones does not confer an inherent increased risk of PEP above the baseline rate described for all forms of therapeutic ERCP. However, the only way of definitively avoiding risk of PEP is by avoiding ERCP. This fact emphasises the necessity of reserving ERCP as a therapeutic procedure for patients with proven bile duct stones, with the diagnosis made through modalities carrying little or no risk of PEP (eg, USS, EUS or MRCP as described above). Abnormal clotting is a feature of biliary obstruction and parenchymal liver disease. Portal hypertension and severe sepsis can also result in thrombocytopenia. A recognised complication of biliary sphincterotomy is GI haemorrhage but the point at which clotting abnormalities become an absolute contraindication to sphincterotomy cannot be asserted from the available evidence. Nonetheless, attempts should be made to correct coagulopathy (including severe thrombocytopenia) before performing sphincterotomy, and if this is not possible initial therapy should involve a procedure with an inherently lower risk of bleeding such as endoscopic stenting. It is therefore recommended that patients undergoing biliary sphincterotomy for ductal stones should have an FBC and INR/PT performed prior to their ERCP. If deranged clotting is identified, subsequent management should conform to locally agreed guidelines. For patients taking warfarin or antiplatelet treatment, the previous BSG guideline95 has been incorporated into a new BSG and ESGE guideline,96 which includes advice on patients prescribed DOACs. This class of drugs include factor 10a inhibitors (rivaroxaban, apixiban) and the thrombin inhibitor dabigatran. They benefit from fewer drug interactions than warfarin and have shorter half-lives. However, they cannot be readily reversed and INR cannot be used to assess bleeding risk.97–99 In the context of ERCP, management of antiplatelet and oral anticoagulant therapy will vary depending on the medication prescribed, the reason for its use and on whether a high-risk procedure (sphincterotomy) or low-risk procedure (stenting) is being considered. For patients taking warfarin, antiplatelet treatment or DOAC, it is recommended that clinicians follow the management algorithms presented in the combined BSG and ESGE guidelines.96 These guidelines advise that for endoscopic stenting alone warfarin is continued and DOACs omitted on morning of procedure. For elective sphincterotomy, the guidelines suggest discontinuation of oral anticoagulation 2–5 days before intervention (depending on the anticoagulant used and patients renal function), with bridging therapy reserved for patients who have a high-risk condition that is being treated with warfarin. In patients taking clopidogrel for a high-risk heart condition, liaison with a cardiologist is advised prior to discontinuation. Access papillotomy (previously described as precut or needle knife papillotomy) is a useful adjunct to endoscopic biliary cannulation in cases where access is difficult. Previous guidance has stressed the need for this technique to be restricted to those who are expert in its use in view of a higher incidence of complication.1 The current guideline recognises that most clinicians performing ERCP will wish to employ access papillotomy in selected cases. It is therefore suggested that endoscopists who perform ERCP acquire sufficient experience during their period of training and mentorship to be able to identify when access papillotomy is indicated and safely perform the procedure. EPBD without prior sphincterotomy has also been described in the management of CBDS. It fell out of general favour in view of an increased risk of pancreatitis and poorer rates of stone clearance (with higher requirements for mechanical lithotripsy) compared with sphincterotomy.79 ,103 ,104 Recently, its role has been reconsidered, based on new meta-analyses,105–108 with evidence of similar rates of success and overall complication for the removal of small (<8 mm) bile duct stones. Meta-analysis has also suggested relative risks of cholecystitis and recurrent CBDS may be lower in patients undergoing EPBD as opposed to biliary sphincterotomy.108 Most studies analysed used an 8 mm diameter balloon regardless of CBD diameter, with longer duration balloon dilation (>1 min to 5 min) being reported as the safest technique.106 It is important to note that the success rates quoted for EPBD in recent meta-analyses included patients randomised to EPBD who subsequently underwent rescue sphincterotomy. In addition, there are a number of accepted contraindications to EPBD without prior sphincterotomy, including biliary strictures or malignancy, previous biliary surgery (other than cholecystectomy), cholangitis, pancreatitis, prior access papillotomy and large CBDS (usually defined as >12 mm).105 The GDG felt that the increased risk of PEP remained an important limitation to recommending EPBD without prior sphincterotomy, but that it did have a role in routine clinical practice, and in particular could be considered where the risk of biliary sphincterotomy was increased, either because of coagulopathy that could not be readily corrected or anatomical factors such as a papilla within a diverticulum. Per oral cholangioscopy allows endoscopic visualisation within the biliary tree and offers the potential to perform lithotripsy under direct vision using electrohydraulic or laser energy. Early studies used a ‘mother and baby’ system, which required two operators, was technically challenging and the cholangioscope broke easily. While it was clear that stones could be treated effectively,109 the above limitations restricted its widespread use and interest in the technique was limited. The introduction of new technologies has rekindled interest in cholangioscopy. The SpyGlass Legacy (Boston Scientific, Natick, Massachusetts, USA) cholangioscope was introduced in 2006 and allows a single-operator cholangioscopy (SOC) to be performed using a disposable cholangioscope, incorporating a fibre optic visualisation system, passed through the duodenoscope. Insertion of accessories through the scope may be a challenge, and the fibre optic visualisation has also been criticised. These concerns may be addressed by a new Spyglass DS digital platform introduced in 2015. In direct per oral cholangioscopy, an ultra-slim video upper GI endoscope is steered through a biliary sphincterotomy and into the bile duct. While image quality is excellent, the major difficulty with this technique is stability of the endoscope within the bile duct due to the duodenal loop. When using this method, the air or CO2 supply is switched off while cholangioscopy is being performed to reduce the risk of gas embolism. The principle of EHL is the generation of a shock wave following the rapid thermal expansion of a fluid caused by a high-voltage spark. A subsequent hydraulic pressure wave causes stone fragmentation. In LL, pulsed laser energy is focused on the stone. The thermal effect that is absorbed by the water contained in stones causes expansion and a shock wave that causes fragmentation. The delivery of such energy needs to be conducted under direct vision to ensure safety and precise targeting during fragmentation. In patients in whom clearance of CBDS has been unsuccessful (despite the use of techniques including mechanical lithotripsy and EPBD with prior sphincterotomy), SOC-guided intraductal lithotripsy using both EHL and LL results in very high stone clearance rates (73–97%).110–112 Similarly, high rates of stone clearance have been reported for direct cholangioscopy, albeit in smaller studies.113 Cholangioscopy is safe but cholangitis has been reported to occur in up to 9% of patients,112 necessitating the use of prophylactic antibiotics. Otherwise complications are comparable to conventional ERCP.114 Cholangioscopy-guided lithotripsy is an important advance in the management of CBDS and is a useful strategy for patients in whom standard techniques fail. Surgical extraction of CBDS at the same time as (laparoscopic) cholecystectomy offers the opportunity to definitively treat gallstone-related disease in a single-stage procedure. Operator, patient and procedure related factors all influence outcome. Although in a minority of patients there remains an important requirement for open surgical treatment, laparoscopic cholecystectomy has superseded open cholecystectomy as the operation of choice for symptomatic gallstones. Over 95% of gall bladders are now removed laparoscopically,115 and more recently the technique of LBDE has become more widely available. LBDE requires (in most cases) a flexible choledochoscope together with light source and camera, and disposable instrumentation similar to that required for ERCP (eg, baskets, balloons, stents). Although open bile duct exploration can be carried out without a choledochoscope, because of the risks involved with blind instrumentation of the bile duct (ie, perforation and traumatisation with increased risk of later stricture development), bile duct exploration should always be undertaken with a choledochoscope unless no alternative is available. There is a significant learning curve for laparoscopic bile duct surgery, both among surgeons and nursing staff.116 In the UK, centralisation of hepatopancreatobiliary resectional surgery into a defined number of units (currently 22) has allowed for the development of LBDE not only within those specialised units but also among benign upper GI surgeons in non-resection centres. The standard way of imaging the CBD intraoperatively is by IOC, which involves transcystic cannulation of the CBD with a fine catheter and direct injection of non-ionic contrast into the bile duct. LUS is an alternative modality but is not as widely available. Both tests show high sensitivity. The IOC rate in the UK varies widely between surgeons but overall is around 10%.115 The advantages of routine or selective IOC have been extensively debated in the literature, and the reader is directed to the 2008 guidance on management of CBDS1 for a full description of the role of IOC at the time of laparoscopic cholecystectomy. RCTs of IOC versus no IOC in patients judged to be at low risk of CBDS17–20 ,26 suggest the use of preoperative results to select patients for further imaging is an acceptable strategy, although it is recognised that some clinicians may opt to perform an IOC in all patients undergoing cholecystectomy. In terms of operative technique, LBDE can be performed under image intensifier control or with the use of an ultra-thin choledochoscope (3 mm). It may involve a transcystic or transductal approach. The transcystic approach is more limited allowing retrieval of only small stones and poor access to the common hepatic duct. Consequently, the majority of surgeons use the transductal approach directly through the CBD. Regardless of exact technique used, the high rates of duct clearance reported with LBDE119 ,120 ,125–129 can be increased to near 100% with the availability of intraductal piezoelectric or LL.130 Long-term results also appear favourable.131 ,132 In patients undergoing laparoscopic cholecystectomy, transcystic or transductal exploration of the CBD is therefore considered an appropriate technique for CBDS removal. It is estimated that only 20% of bile duct explorations are performed laparoscopically at the present time,115 with findings from a 2005 survey of English hospitals suggesting less than one in three units treat patients using this technique.133 Given that ERCP and laparoscopic cholecystectomy involves two procedures (unless the former can be performed intraoperatively), it is suggested that surgeons are trained in LBDE in order to decrease the number of interventions required to manage CBDS. Extraction of ductal stones via an endoscopic biliary sphincterotomy or laparoscopic route may be difficult for a variety of reasons. In most situations, size, shape and number of stones are the key determinants of whether extraction will be easy or not. The likelihood of successful extraction can also be reduced in patients who have altered anatomy as result of previous surgery (see section on stone extraction in patients with altered anatomy). Where standard stone extraction techniques supplemented by mechanical lithotripsy, EPBD with prior sphincterotomy and cholangioscopy (or, where available, extracorporeal shock wave lithotripsy) fail to remove stones, the patient can be considered to have difficult stone disease. For the small number of individuals in whom problems persist despite deploying the above techniques, percutaneous stone extraction and open duct exploration are sometimes necessary and should be considered when less invasive options fail or are not possible. Even the most skilled endoscopist will fail to achieve deep biliary cannulation in a minority of cases. Clinicians should be aware of the role of combined procedures to achieve access to biliary system. Typically these involve image-guided percutaneous insertion of a catheter into the biliary system via the intrahepatic ducts or gall bladder, through which a guidewire is introduced into the duodenum. This can then be used by an endoscopist to achieve retrograde cannulation. More recently, EUS-guided biliary drainage has been described as an alternative to percutaneous intervention.136 Two main forms of EUS-guided drainage have been reported. The first involves accessing the extrahepatic ducts, which is usually performed via the duodenum. The second involves accessing the intrahepatic ducts, which usually involves puncture of the left lobe of the liver via the stomach. Once biliary access has been achieved, the endoscopist can then pass a wire to facilitate treatment, which can be performed in an antegrade fashion or combined with ERCP and retrograde therapy. A recent meta-analysis of (predominantly) retrospective cohort studies suggests this is a valid management option for biliary strictures.137 While appropriately trained clinicians may wish to consider EUS-guided access for selected cases of CBDS, it should be noted that there are limited data on its role in this setting and at present there are few centres that have the facilities and expertise to employ this approach routinely. For patients >70 years of age or with debilitating disease, biliary stenting has also been examined as an alternative to endoscopic stone extraction.139 ,140 The technique compares favourably with conventional stone extraction techniques in terms of immediate success and complication rate. However, at least a quarter of patients experience recurrent cholangitis during follow-up. Long-term results are probably more favourable in those patients without a gall bladder.140 More recently, a study from Italy looked at the management of long-term stents in patients with CBDS that were difficult to remove by conventional means. Over a mean follow-up period of 14 months, there was a 36% cholangitis rate in patients who had stents changed on demand with an associated mortality of 8%. Patients who had stents changed electively at three monthly intervals had an 8% cholangitis rate and 2% mortality.141 As such, patients faced a high risk of complication or multiple interventions. In light of the above findings, biliary stenting is recommended as a means of ensuring adequate biliary drainage in patients for whom further therapy is planned. However, stenting as definitive treatment for CBDS should be restricted to a very few patients who have limited life expectancy or are judged to be at prohibitive surgical risk. Clearance of bile duct stones should be considered the standard of care,28 and patients should be referred to specialist centres for consideration of surgery or advanced endoscopic therapy if stones cannot be removed using standard stone extraction techniques. Laparoscopic cholecystectomy and ERCP are now mature technologies, and in some areas of practice, there has been no major change in recommendations in comparison to the 2008 guideline. Areas where advice has changed include treatment of acute gallstone pancreatitis. For patients with gall bladder stones and stones in the CBD, there is a risk of cholecystitis and/or stone migration following duct clearance. A Cochrane review published in 2007142 addressed the question as to whether prophylactic cholecystectomy should be offered to patients whose gall bladder remains in situ after endoscopic sphincterotomy and CBD clearance. Systematic review identified five randomised trials involving 662 participants. The studies included both open cholecystectomy and exploration,143–145 and laparoscopic cholecystectomy,146 ,147 as the surgical intervention of choice. Meta-analysis indicated that over a follow-up period that varied between an average of 17 months to over 5 years mortality was higher in the wait and see group than in the prophylactic cholecystectomy group (14.1% vs 7.9%; relative risk 1.78, 95% CI 1.15 to 2.75) and that the benefit of surgery persisted when analysis was restricted to those studies that included patients at higher surgical risk, as defined by an American Society of Anaesthesiology score of 4 or 5.143–145 ,148 Secondary end points of recurrent pain, jaundice and cholangitis were also significantly more common in the wait and see group. Two more randomised trials have been published since this meta-analysis. In one, prophylactic cholecystectomy after CBDS extraction was compared with a policy of leaving calculous gall bladders in situ. Prophylactic cholecystectomy reduced the incidence of subsequent cholecystitis but not cholangitis.149 However, only 90 participants were included and the study was limited by significant crossover between the allocated treatment arms. In the second study,150 162 participants, all of whom were over the age of 70 years and had coexisting gall bladder stones, were randomised to wait and see or cholecystectomy after successful endoscopic duct clearance. A significant reduction in total biliary events (which included cholangitis) was seen in the group undergoing elective cholecystectomy. Uncertainty persists as to whether the recommendation to offer cholecystectomy to patients with gall bladder stones and CBDS should be extended to individuals with CBDS but an empty gall bladder on imaging. Several large observational studies have examined the importance of gall bladder status in Asian patients who have undergone successful endoscopic duct clearance.151–153 Over a period of follow-up that varied from a median of 34 months151 to 15 years,153 these studies reported recurrent CBDS in 15–23.7% of patients with residual gall bladder stones. This contrasted with patients who had an empty gall bladder in situ, where the reported incidence of recurrent CBDS was significantly lower at 5.9%152 to 11.3%.153 In contrast, smaller studies of both Asian154–157 and European patients158–160 have not been able to clearly demonstrate a higher likelihood of recurrent CBDS following duct clearance in patients with gall bladder stones. However, several reports suggest that patients with an empty gall bladder have a lower risk of cholecystitis and subsequent cholecystectomy.155 ,158 ,160 Surgeons may therefore wish to discuss a wait and see approach with patients who have an empty gall bladder following duct clearance. Despite the benefits of cholecystectomy, the operative risk for some patients will be judged prohibitive. Given that age and comorbidity do not appear to have a significant impact on overall complication rates for ERCP,161–164 biliary sphincterotomy and endoscopic duct clearance alone is an acceptable alternative for this group. While there is no formal comparison of endoscopic versus surgical extraction of CBDS in patients who have undergone previous cholecystectomy, the minimally invasive nature of ERCP means that this remains the primary form of treatment in this setting and no change has been made to the recommendation for this category of patients. Historic data suggest that the risks of emergency biliary surgery in older patients can be significant,165–168 and in the context of acute cholangitis the role of ERCP is now well established.169 High-quality data on the optimal timing of ERCP in this setting are lacking but early intervention is likely to be beneficial. A recent prospective study of 199 patients admitted to hospital with acute cholangitis found that for each day that ERCP was delayed length of stay increased by 1.44 days (95% CI 1.01 to 1.92). The study also identified an increased requirement for vasopressors in patients who had ERCP performed >72 hours after presentation.170 For patients with signs of septic shock or who are deteriorating despite appropriate antibiotic therapy, biliary decompression may need to be achieved urgently (ie, within 24 hours of presentation). As described in previous guidance, in circumstances where ERCP fails or is unavailable percutaneous biliary drainage is an alternative form of treatment. A recent Cochrane review173 has found no evidence that early routine biliary sphincterotomy±endoscopic stone extraction significantly affects mortality or complications regardless of the severity of the pancreatitis. The analysis did support a strategy of early biliary sphincterotomy±endoscopic stone extraction in patients with cholangitis or biliary obstruction. There is heterogeneity in studies as to what constitutes ‘early’ ERCP, with variation from <24 to <72 hours following admission. There is no evidence to support ERCP within 24 hours rather than ERCP within 72 hours. However, no studies have been designed to answer this question. It is therefore recommended that patients with pancreatitis of suspected or proven biliary origin with associated biliary obstruction or cholangitis should undergo biliary sphincterotomy±endoscopic stone extraction within 72 hours of presentation. Within this group of patients, clinicians should be alert to individuals with severe sepsis in whom optimal management may involve urgent ERCP within 24 hours, as described in the preceding section. Conversely, it is recognised that a number of cases of jaundice without sepsis may resolve or improve significantly over a period of 24–72 hours. In this situation, early ERCP can be avoided, although the clinician should consider additional imaging (MRCP, EUS, IOC or LUS) to exclude retained ductal stones and help decide whether biliary sphincterotomy is required to reduce the likelihood of future problems as described below. The greatest reduction in risk of recurrent events may be seen when patients undergo both sphincterotomy and cholecystectomy.179 As such, patients who require sphincterotomy and duct clearance in the context of acute gallstone pancreatitis should still be considered for subsequent laparoscopic cholecystectomy,142 although there is currently insufficient evidence to recommend routine biliary sphincterotomy for all patients listed for laparoscopic cholecystectomy following mild acute gallstone pancreatitis. ERCP for CBDS extraction can be successfully performed in patients with Billroth II anatomy. Where ERCP with a duodenoscope is difficult, use of a forward viewing endoscope is recommended. (Moderate-quality evidence; weak recommendation). Many experts believe that in the presence of an intact papilla the use of a side-viewing duodenoscope facilitates both cannulation and subsequent therapy because of the elevator and large accessory channel. A forward-viewing endoscope however has advantages of flexibility and luminal visualisation that makes it possible to reach the papilla in Billroth II patients when an approach with a duodenoscope has failed. The single RCT that has compared forward-viewing endoscopes with conventional duodenoscopes demonstrated a higher success rate with forward-viewing endoscopes (87% vs 68%) and a higher complication rate with duodenoscopes (namely an 18% visceral perforation rate).182 This has not been confirmed by other reports that have described a perforation rate of 2.7–10%.183 ,184 An approach of duodenoscope first followed by forward-viewing endoscope if there is initial failure is a reasonable strategy. The ‘upside-down’ (5 o'clock) orientation of the papilla when approached from the afferent limb after Billroth II gastrectomy requires a significant alteration in sphincterotomy technique. Successful outcomes can be achieved by using sphincterotomes that have been modified to alter the orientation of the cutting wire or by using conventional sphincterotomes that can be rotated. However, in some cases safe, effective orientation of the cutting wire cannot be achieved. As a consequence, it is not always possible to perform the full sphincterotomy that is required for successful removal of stones. Biliary sphincterotomy using a needle knife, with a straight plastic stent as a guide, is an alternative method that has been described in a number of series. Compared with EPBD, it is reported to have equal efficacy.185 As discussed in previously, there remain concerns about the risk of pancreatitis in patients undergoing EPBD without prior sphincterotomy. An approach that combines limited biliary sphincterotomy with a needle knife over a straight plastic biliary stent or guidewire, followed by EPBD and conventional stone extraction, has been reported.186 It is becoming the method preferred by experts, and potentially combines ease of use, safety and efficacy. The rapidly increasing health burden of obesity is driving an increase in bariatric surgery. Gallstone disease is a significant problem in the obese population and also in patients who have undergone weight loss procedures, of which the most commonly performed is a laparoscopic RYGB. The long afferent limb of the RYGB that is deliberately fashioned at surgery effectively means that the only endoscopes that can be used in a conventional per-oral retrograde approach are enteroscopes with either a single or double balloon, or a spiral overtube. Selection and use of accessories is difficult, both because of the narrower working channels and length of the enteroscope. A large retrospective series compared enteroscopic techniques in 129 patients with Roux-en-Y reconstruction, of which 63 had post- RYGB anatomy with an intact papilla. Successful ERCP was achieved in 63% of these patients with a 12% complication rate.187 There was no significant difference in outcomes according to the enteroscopic technique used. Laparoscopically assisted ERCP in post-RYGB patients is a technique that has been reported in larger numbers and the individual component techniques and skills are more readily available. A laparoscopic gastrostomy is created and at the same session ERCP is performed following which the gastrostomy is closed. A retrospective series from the USA compared this technique to long-limb enteroscopy in 56 patients.191 The therapeutic success rate for laparoscopic-assisted ERCP was 100% versus 59% in the enteroscopy group. There was no difference in hospital stay or complications in either group. Although there are organisational challenges with this technique, it is probably the best option currently and could be delivered by the majority of larger volume secondary care units. Delivery of the achievable aims for ERCP service provision and training will require organisations to review the way their services are provided. Key performance indicators in the BSG standards framework75 include having sufficient capacity to deliver ERCP 52 weeks a year; adequate interventional radiology support; access to anaesthesia-supported ERCP and regular morbidity and mortality meetings that are able to demonstrate outcomes that meet minimum standards. To achieve some of these key performance indicators will involve hospitals working collaboratively in the context of operational networks. While additional resources will be needed in some areas, there is also the potential to avoid the costs incurred by delayed intervention, adverse events, repeat procedures and prolonged hospital stays. Similarly, if LBDE is to be made available to all patients who could potentially benefit there will need to be a sufficient number of trained surgeons and service planning will need to reflect this. Intraoperative ERCP is a valid alternative to LBDE, but it is recognised that coordinating the relevant specialty teams and resources to deliver this on a routine basis within the National Health Service would require improved integration of medical and surgical gastroenterology services. Studies that use adequate periods of clinical follow-up to assess the diagnostic accuracy CBDS diagnosis using clinical, LFT and USS findings in combination. Studies of the natural history of CBDS, particularly in asymptomatic patients in whom extraction is not performed. Randomised control study of MRCP versus EUS in the diagnosis of suspected CBDS. Studies to define minimum standards/key performance indicators for services offering endoscopic and surgical CBDS clearance. The features of a high-quality service as measured by patients being treated for CBDS. Studies to establish the optimum treatment algorithm for removal of large CBDS. Studies to clarify the harm/benefit of routine IOC in patients with low risk of CBDS. Studies to clarify the role of pancreatic duct stenting in patients receiving rectal NSAIDS. This guideline has been reviewed and endorsed by The Faculty of Clinical Radiology of The Royal College of Radiologists. GRADE criteria. http://www.gradeworkingpartygroup.org (accessed 01/06/2014).
. Preoperative bilirubin, alkaline phosphatase and amylase levels as predictors of common duct stones. Surg Gynecol Obstet 1982;154:381–4.
. Elective laparoscopic cholecystectomy without routine intraoperative cholangiography: a retrospective analysis of 1101 consecutive cases. Scand J Surg 2010;99:197–200.
. [Intraoperative cholangiography as a routine method? A prospective, controlled, randomized study]. Chirurg 1997;68:892–7.
. The natural history of gallstones: the GREPCO experience. The GREPCO Group. Hepatology 1995;21:655–60.
. Does selective peroperative cholangiography result in missed common bile duct stones? J R Coll Surg Edinb 1993;38:220–4. Commissioning Guide: Gallstone Disease. Association of Upper Gastrointestinal Surgeons The Royal College of Surgeons of England, London. 2013.
. [Ultrasonics in the diagnosis of choledocholithiasis]. Rev Med Chil 1989;117:40–1.
. A prospective experience with selective cholangiography. Am Surg 1998;64:654–8; discussion 658–9.
. Relative merits of ultrasonography, computed tomography and cholangiography in patients of surgical obstructive jaundice. Hepatogastroenterology 1998;45:2027–32.
. Validity of ultrasonography in diagnosing obstructive jaundice. East Afr Med J 2005;82:379–81.
. Predicting the presence of choledocholithiasis in patients with symptomatic cholelithiasis. Am J Gastroenterol 1996;91:762–7.
. EUS Guided ERCP in patients with negative cross sectional imaging but high clinical probability of choledocholithiasis. Gastrointest Endosc 2012;75(Suppl 4):AB203.
. Detection of common bile duct stones before laparoscopic cholecystectomy. Evaluation with MR cholangiography. Acta Radiol 2002;43:593–8.
. Prospective single blinded study of endoscopic ultrasound prior to endoscopic retrograde cholangiopanctreatography for patients for a positive intraoperative cholangiogram. Gastrointest Endosc 2012;75(Suppl 4):AB203.
. A comparison of the diagnostic accuracy of EUS and ERCP in identifying common bile duct stones. Gastrointest Endosc 2002;55:AB246.
. Diagnostic accuracy of MRCP in choledocholithiasis. Radiol Med (Torino) 2005;109:239–51.
. Diagnosis of asymptomatic common bile duct stones: preoperative endoscopic ultrasonography versus intraoperative cholangiography—a multicenter, prospective controlled study. French Associations for Surgical Research. Surgery 1998;124:6–13.
. Success of initial ERCP following therapeutic failure. Gut 2007;7(Suppl II):A88. Guidance for the use of propofol sedation for adult patients undergoing endoscopic retrograde cholangiopancreatography (ERCP) and other complex upper GI procedures. On behalf of the Joint Royal College of Anaesthetists and British Society of Gastroenterology Working Party. 2011. Surgical Workload and Outcomes Audit Database (SWORD). http://www.augis.org/sword/database (accessed 4/2015).
. The learning curve for laparoscopic cholecystectomy. The Southern Surgeons Club. Am J Surg 1995;170:55–9.
. Laparoscopic common bile duct exploration with primary closure for management of choledocholithiasis: a retrospective analysis and comparison with conventional T-tube drainage. Am Surg 2014;80:178–81.
. Laparoscopic management of common bile duct stones. A multi-institutional SAGES study. Society of American Gastrointestinal Endoscopic Surgeons. Surg Endosc 1994;8:1168–74; discussion 1174–5. , the Steering Committee, BSG Audit of ERCP. Diagnosis and management of suspected common bile duct stones in patients fit for cholecystectomy: a survey of 5 UK regions. Gut 2006;55:A94. (361) Abstract.
. Bacteriological study of choledochal bile in patients with common bile duct stones, with or without acute suppurative cholangitis. Hepatogastroenterology 1989;36:132–5.
. Surgery vs endoscopy as primary treatment in symptomatic patients with suspected common bile duct stones: a multicenter randomized trial. French Associations for Surgical Research. Arch Surg 1998;133:702–8. American Society of Anesthesiologists ASA Physical Classification System. https://www.asahq.org/resources/clinical-information/asa-physical-status-classification-system (accessed 23 Aug 2016).
. [Therapeutic biliary endoscopy in patients over 90 years of age]. An Med Interna 2002;19:409–11.
. Operative risk factors of cholecystectomy-choledochotomy in the elderly. Surg Gynecol Obstet 1983;157:15–19.
. Biliary lithiasis in the elderly patient: morbidity and mortality due to biliary surgery. Hepatogastroenterology 1997;44:1565–8.
. Variations in implementation of current national guidelines for the treatment of acute pancreatitis: implications for acute surgical service provision. Ann R Coll Surg Engl 2002;84:79–81. Contributors The following all contributed to the manuscript as members of the guideline development group. Specific responsibilities were as follows: Peggy and Hannah Anderson. Patient representatives, approached via British Liver Trust. Reviewed draft and commented on recommendations relevant to patient experience. IB, lead author for section on surgical management of CBDS; coordinated feedback from surgical societies. GES, reviewed draft as a GI trainee and was responsible for initial literature search. KG provided critical review of evidence and methodology based on personal research and participation in other guideline development groups. Co-author for sections relating to development process for current guidelines; identifying individuals with CBDS and surgical management of CBDS. RS, lead author for sections relating to management of "difficult" ductal stones and management of CBDS in specific clinical settings. GW, lead author for section relating to endoscopic management of CBDS: EW, Chair of GDG and lead author for introductory and concluding sections, including those relating to general principles in management of CBDS and identification of individuals with CBDS. Responsible for editing contributions and document management. TY, co-author of section on identifying individuals with CBDS. Responsible for coordinating feedback from radiological societies. Competing interests GW has sat on the Advisory Board for Cook Medical and Boston Scientific. He has received help from both companies in order to deliver live endoscopy courses and has had financial support to cover the costs of attending national and international meetings as a speaker. RS sits on the Advisory Board for Boston Scientific.